When Tania and Mike Voaden bought their stylish home in Kentish Town, North West London, 15 years ago it had everything they were looking for. The location, on a quiet cul-de-sac, the period features, persevered thanks to the street’s conservation status, and the space, two sizeable bedrooms, ticked all of the boxes for this new family. As Tania and Mike’s family has expanded to include three children, now aged 10, seven and four, the once spacious house began to feel cramped. The Voadens were left with a difficult decision – they could either move to a bigger house, or renovate the much loved family home to suit their new needs. “When my husband and I bought this house 15 years ago it was the perfect size and location”, says Tania Voaden, the homeowner and an administrator at a local primary school in Kentish Town. Not only did the Voadens feel short of living space, they also felt passionate about creating a lighter and airier home with higher ceilings and more windows, bringing aspects of the outside in. With no real source of natural daylight, the family was shadowed in darkness and noticed the effects of living in a home lacking in brightness. Mike and Tania grew tired of the clutter and lack of ‘breathing space’ in the house. They knew what they wanted to do, but just weren’t sure how. With the help of Martins Camisuli Architects Tania and Mike made the decision to create a larger, brighter, open plan kitchen / living room at the back end of their property, to remove a disused and cramped attic to allow daylight to filter throughout the home and to add a third bedroom above the newly created extension. Leading on the project was MD Sebastian Camisuli and one of his first recommendations was to introduce natural light from above throughout the house. With Fortess Grove sitting in a conservation area, there were limits on external fenestration meaning that the Voadens were restricted from using large picture windows to allow light in. Sebastian’s solution was to add VELUX roof windows to all three of the bedrooms, the upstairs bathroom and in the newly created kitchen, giving each space a real wow factor. 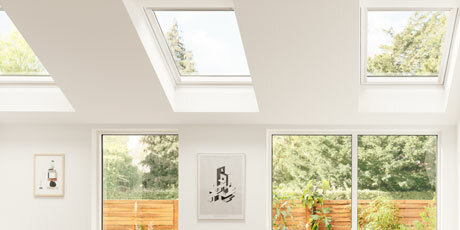 The use of VELUX centre-pivot roof windows in white polyurethane finish allowed for the maximum amount of daylight and fresh air to enter the home, while keeping the look clean and contemporary throughout. The addition of just five VELUX roof windows in increasing natural daylight in the home has been a revelation for the family. The Voadens set out to increase their family living space, and what they got in return is a bright and airy home that perfectly integrates both old and new aspects of the building. Both Tania and Mike are now proud to welcome people into the home, with the transformation not going unnoticed by their guests either.